A major exhibition dedicated to Black Sabbath, their legacy and their fans, is to take place later this year in their home town of Birmingham. It’s been brought together by Home Of Metal in conjunction with Birmingham's Museums Trust and has been organised in celebration of the band’s 50th anniversary. 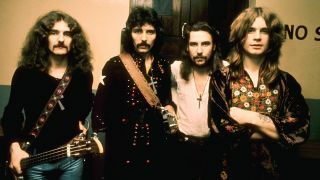 Tony Iommi adds: “Fans are our lifeblood – they've always been there to support us,” while Geezer Butler says: “I’ve always maintained that Sabbath fans are the most loyal and honest and most independently minded of all. “I thank each and everyone of them for their incredible support over the years." Tickets for Home of Metal: Black Sabbath - 50 Years will go on sale from mid-March from the company’s official website. In addition to the Sabbath exhibition, Birmingham Museum & Art Gallery, The New Art Gallery Walsall, MAC (Midlands Art Centre) Eastside Projects, and Centrala will also run events from May until September celebrating the the history, art and culture of heavy metal.